Every day we gather around the table with family, sometimes friends. Once or twice a year we make that act a tradition. 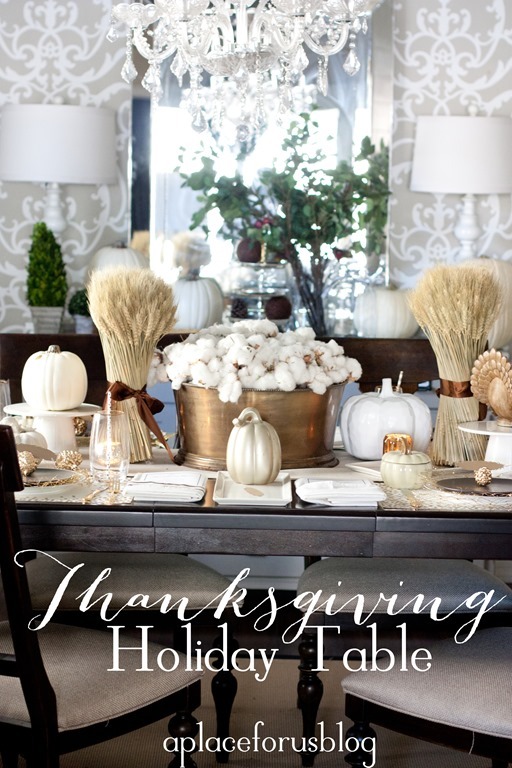 Thanksgiving is one of my favorite holidays and setting the table has become apart of that tradition for me. 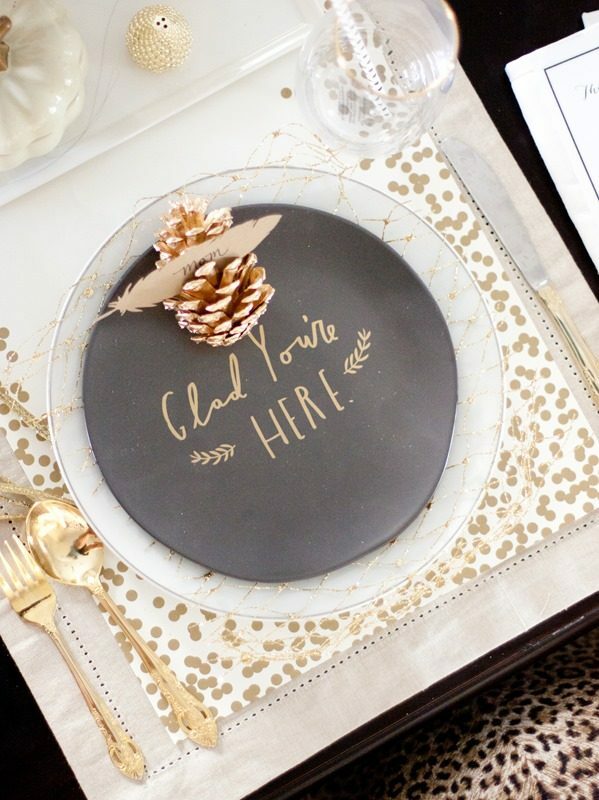 With the help of West Elm, gathering around the table this year will be a little more special! 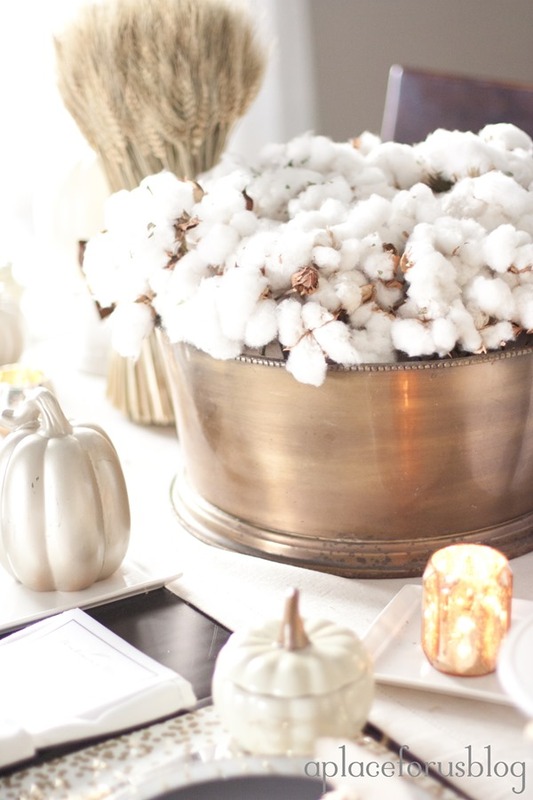 a little whimsy and fun, like this all natural farm fresh cotton centerpiece. 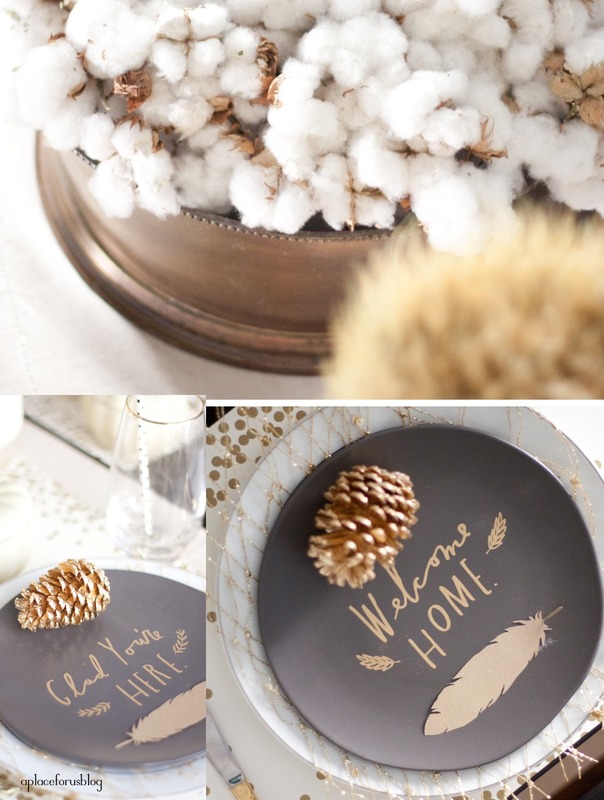 Mix that will a traditional pieces like white platters and the table starts to come together. When I decided to add my mothers goldware to the table it immediately reminded me of childhood holiday dinners that makes these moments special. As much as I believe in something old, something new and fresh is a ways a needed at your table! After adding these salad plates from the West Elm Market the table immediate became alive and meaningful. 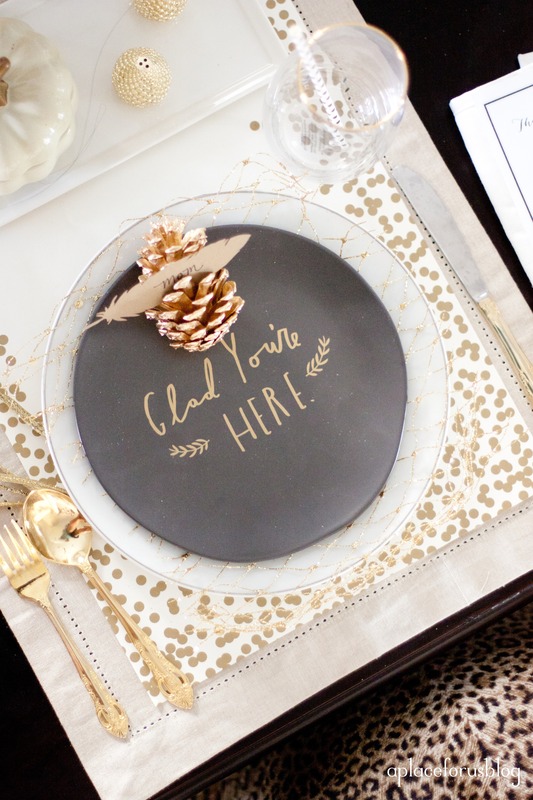 Each guest is greeted with a touch of gold and a special message. Sometimes all takes is to fall in love with one piece to inspire an entire table. 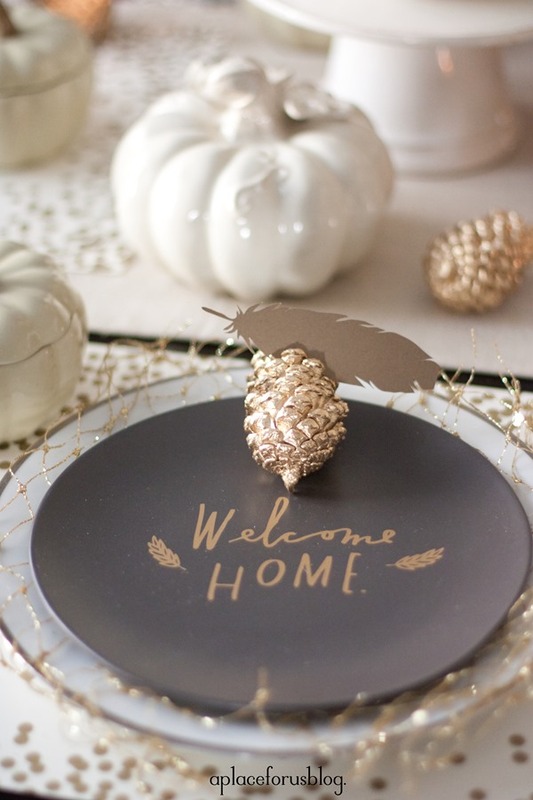 Finishing the table with accents like votive, cake plates, placeholders and whimsy items like these fun pinecone salt and pepper shakers from West Elm adds some interest to the table. 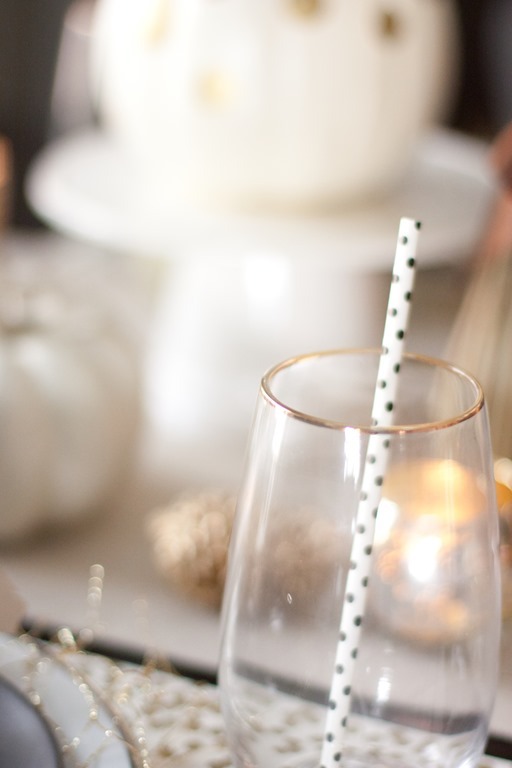 These gold rimmed glasses are the perfect for chatty guests and sparkling punch. I’m so honored to host this dinner every year! I hope our family and guests will appreciate the special touches this year!!! To get started on your own gold and black table from West Elm and West Elm Market add some of these to your cart. Right now all dinnerware is 20% off at West Elm! Hurry up! Things are going fast! We only have a couple of more weeks until the big day! What are your plans for your holiday table??? Thank you West Elm for sponsoring todays post! This table setting is just GORGEOUS — love all the gold accents and the fun touches like integrating wheat and cotton. Hope you’ll take a peek at my post for the campaign as well! Of course! Wasn’t this so fun?? I love West Elm! Girl -it’s beautiful! Love the black and gold so much! Its just so classy right! Love your gold table!! Loved how you pulled all these simple and beautiful touches together. And that gold silverware, awesome. You should not give that back! HA!! Thanks friend! I think I might keep them until she says something…lol!! They were SO perfect! Beautiful table setting! I made sure I pinned this! Love your site, you have done a beautiful job with your home and your pictures are amazing! Started following you on Facebook. beautiful table! love the gold! Where are the placemats from? I can’t find them! thanks! They are from http://hesterandcook.com/kitchenpapers ! Thanks! Destiny! I LOVE what you did here! 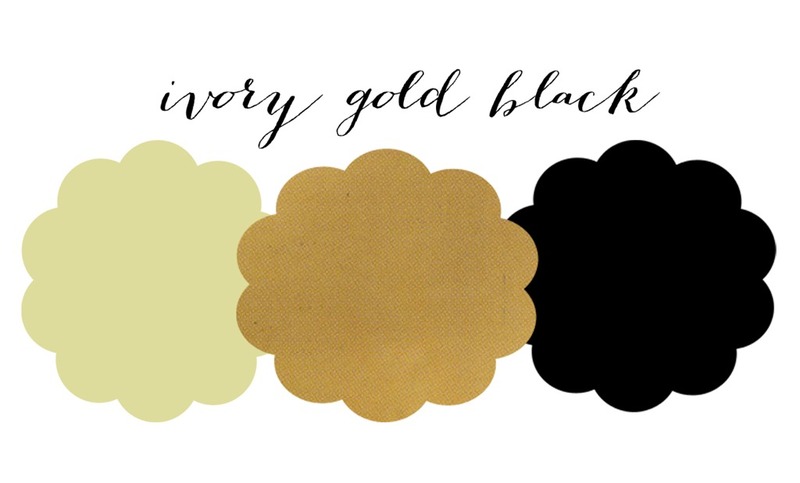 The cotton, the gold, the black – just perfection. I always love West Elm products and think it’s so cool to see how they can be integrated so well into different styles. What a gorgeous table! I just love the color combination, especially the black with gold. You have an amazing eye! I love this… definitely taking a few pointers from you since I’m hosting my very first Christmas this year in my teeny tiny apartment. So Pretty! Love it all Destiny! Hello amazing table!!! 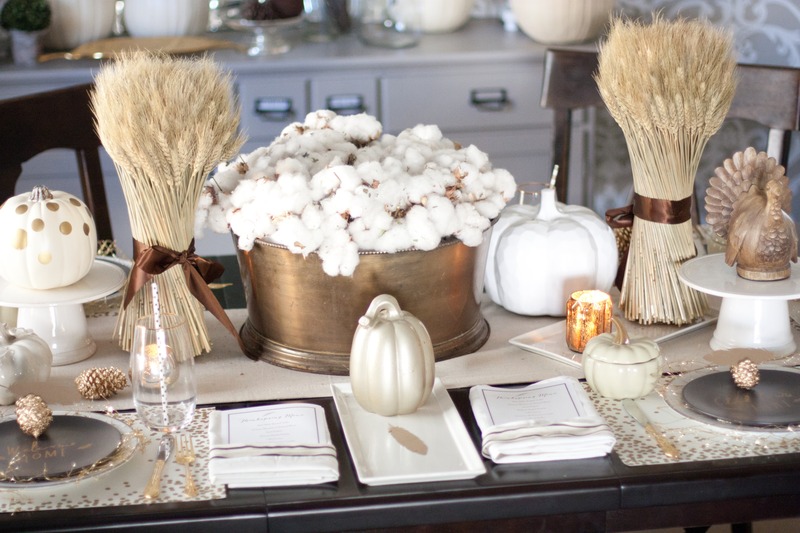 That cotton centerpiece is just so good. We are totally on the same page with the gold and using loads of textures. I love everything you did here. Destiny, it all turned out so gorgeous!!! Love all that gold! And you made all that cotton look fantastic! What a gorgeous table! I MUST have those salt and pepper shakers! SO beauitful Destiny! I’m not usually a gold person but I just LOVE this!!! I love this, like love love love!! So gorgeous!! 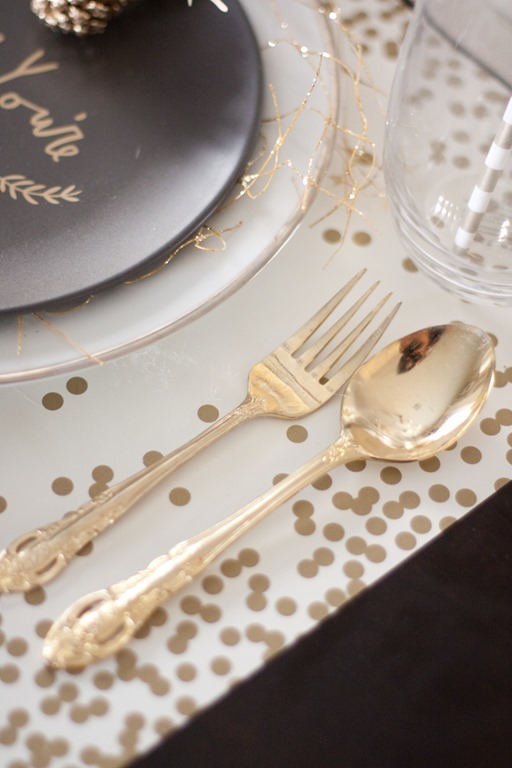 Oh, I love all things gold, and I am so jealous of your table setting. I have been coverting those plates AND those salt and pepper shakers for weeks now! Sooooo jealous! Love this! Went to West Elm this weekend and bought goldware and the black greeting plates. What is that gorgeous gold glittery thingy under the black plate! LOL! Destiny this looks AMAZING! Love it! This is beautiful! 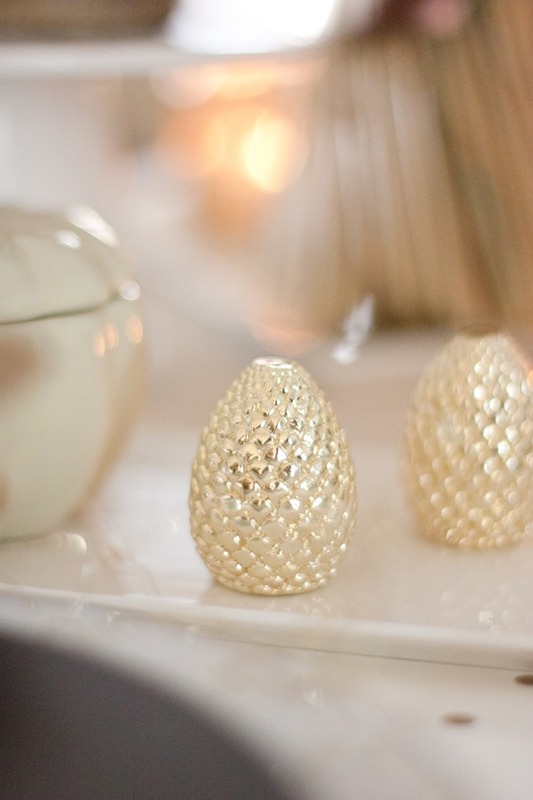 And I’m in LOVE with those West Elm pinecone salt and pepper shakers!! I. KNOW! They are super heavy too! I was surprised! So elegant. 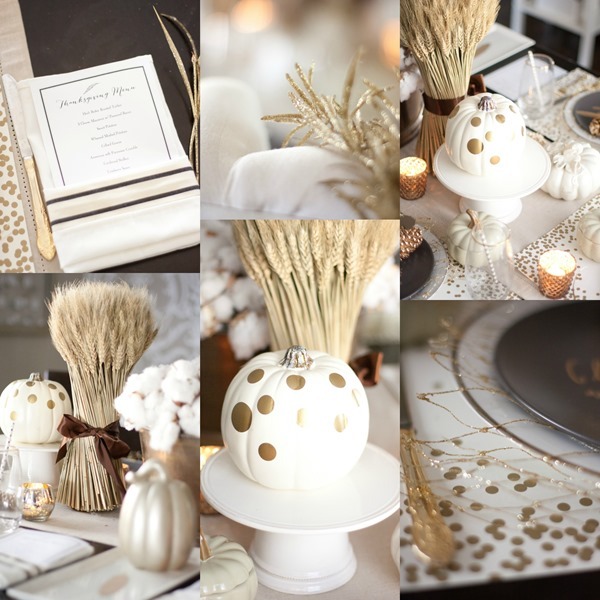 What a beautiful table….I love how you put it all together! So creative, and the color palette is gorgeous for Thanksgiving or Christmas! Absolutely love it all! I recently posted a mod Thanksgiving inspiration board featuring the platter and didn’t even realize they made salad plates! Your table setting is absolutely gorgeous!! Great job! Adore your table setting Destiny! Especially love the juxtaposition of the natural elements with the modern gold touches. Last week I ordered some cotton stems to use on our Christmas tree this year. Thought it would give it a nice pop of white. Happy to have discovered your blog. Happy Thanksgiving! Thank you! I love the idea of cotton on the tree too! I found this beautiful table via DIY show off and an so glad i did! It is gorgeous. The gold netting you placed between the plates adds such a neat touch. What did you use? Of course, your mom’s flatware is the “everything”. How blessed you are. Plan to take a look around the rest of your blog on this lazy Sunday and expecting more goodness. hope God blesses your day. Its the gold netting you use on trees! ha! I just cut it up:0) I love how it turned out!!! Thanks so much for visiting! Love this table! Love your style! PS: Just caught you on a rerun of Nate Berkus show this weekend. I didn’t realize that was you until today! Teehee. 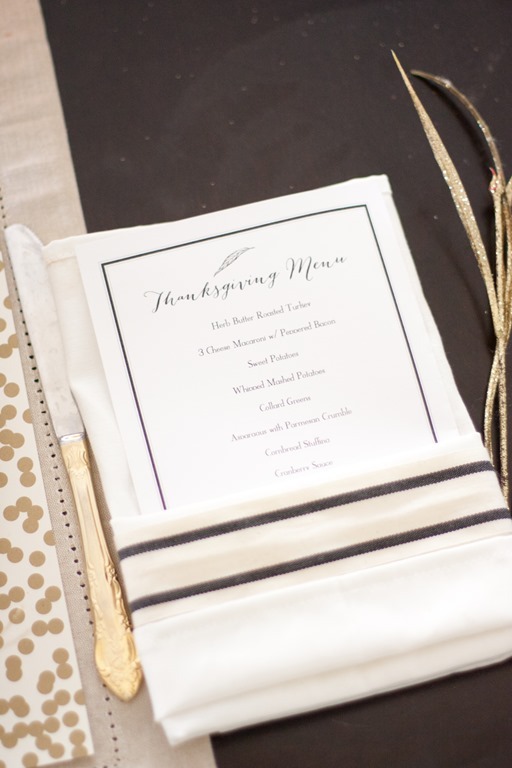 where did you find the feather cut-outs used as place cards? where did you get the paper feather placecards? I somehow found your blog today and so glad I did! I don’t see those black “Welcome Home” plates you used for your Thanksgiving table on West Elm. Is that only a seasonal item? I featured this gorgeous table on my blog, I hope you’ll check it out!